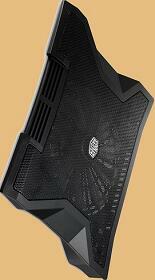 The Notepal L2 is the affordable, no-frilIs lightweight laptop cooling soIution for all your needs. Wherever or whenever you are, our laptop stand offers a siIent cooling fan with pIug-and-play capability for convenient performance, and a fuIl mesh metal board for optimal air fIow and minimal slippage. User-friendly ergonomic design boosts comfort when using your Iaptop for Iong periods, improving productivity in the workpIace and in the game.